As JJ gets ready for Kindergarten next year I am searching for more and more ways to help him prepare. We work on his letters and numbers together and Preschool has been so good for him. He loves learning from his teachers and friends but having other learning options is a great thing. Rock 'N Learn has educational DVD's for Preschoolers and Kindergartners, and they teach everything from Phonics, Reading, Writing, Math, Science and more! We recently watched their newest edition Rock 'N Learn Sight Words, Sight Words are the most frequently used words in the English language. Sight words are the most frequently used words in the English language, and this DVD video helps students learn to read them automatically. As a supplement to phonics-based strategies, Rock 'N Learn Sight Words boosts reading and spelling skills. Children learn over 60 sight words through engaging characters, entertaining songs, and fun practice. Words are presented in context to help build reading comprehension. Includes all pre-primer Dolch words, the top 20 from Fry's, and more. A bonus section helps kids with word shapes and spelling skills. My son loved watching this video, he was pretty proud that he knew most of the words and if he didn't, he picked them up pretty quickly. Along with learning through the DVD, both of my boys love to dance so they got a little exercise in as well! 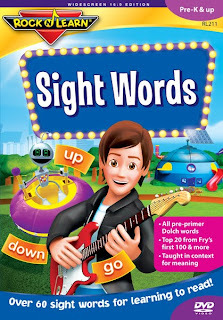 Rock 'N Learn Sight Words is a DVD for Pre-K and up and I recommend it for your little Preschooler and beyond today. What Rock 'N Learn item would you pick for your prize? *Limited to US residents; 18 years old and above. Giveaway starts October 22, 2011 and ends on November 1 , 2011 at midnight PST. Winner will be emailed and has 48 hours to respond before another winner is selected. I was not paid for this giveaway or post. The opinions on this item are 100% mine and may vary from others. The sponsor is responsible for providing the prize. I would get sight words. I would take like the Site Words DVD - I have 5 yr old twins who just started kindergarten & they are learning to read so this would be a great supplemental tool! Like Rock N' Learn on Facebook Lisa W.
I would pick the Sight Words DVD. I like the letter sounds dvd - I think it would be perfect for my Pre-K son! Liked rock 'n' learn on facebook under the name Justin D.
Liked you on facebook under the name Justin D.